Sameni, J., Krigstin, S., and Sain, M. (2017). "Solubility of lignin and acetylated lignin in organic solvents," BioRes. 12(1), 1548-1565. The solubility of four lignin samples and their acetylated forms was determined in a series of organic solvents to investigate the relationship between solubility and the solubility parameter. The solubility parameter of lignin samples and acetylated lignin was calculated based on the number of atoms or groups on lignin units. Lignin samples were obtained by isolating lignin from lignocellulosic bioethanol residues (Lignin 1 [L1]), isolating lignin from kraft hardwood black liquor (Lignin 2 [L2]), commercial kraft softwood lignin (Lignin 3 [L3]), and commercial soda non-wood lignin (Lignin 4 ). The solubility of lignin in organic solvents was not predictable due to poor correlation between the solubility of lignin and its solubility parameter. However, the solubility of lignin in an organic solvent depended on the molecular weight and the aliphatic hydroxyl number of the lignin. L2, with a lower molecular weight than other lignin samples, had the highest solubility in organic solvents, and L3, with highest aliphatic hydroxyl number, had the lowest solubility in organic solvents. All acetylated lignins were soluble in most of the organic solvents. Furthermore, the molecular weights of the soluble parts of all four lignins in ethyl acetate were found to be lower than the original lignins. Lignin is isolated from low quality residue in pulping industries and biorefineries with the goal of increased profitability (Doherty et al. 2011). However, a major portion of isolated lignin is burned as fuel, and a small portion is utilized for value-added products. Unknown molecular structure, broad molecular weight distribution, and variability in the physico-chemical properties of lignin make the lignin less applicable in many areas (Lora and Glasser 2002). The solubility of lignin in organic solvents is also not clear and depends on many variables such as chemical structure, molecular weight, and the presence of hydrophilic moieties in the lignin molecule (Shukry et al. 2008). Acetylation is a technique that can improve the solubility of lignin in organic solvents (Olarte 2011), and it can be used as a pretreatment method when a soluble form of lignin is required in the manufacturing processes. For instance, acetylated lignins were used for producing lignin microspheres (Asrar and Ding 2010), thermoplastics/lignin composites (Jeong et al. 2012), lignin-based thermoplastic polyurethanes (Jeong et al. 2013), and lignin carbon fibers (Zhang and Ogale 2014). Understanding the solubility of lignin and acetylated lignin in organic solvents helps to utilize lignin for producing high value-added products. where E is the cohesive energy (cal/mol), Vm is the molar volume (cm3/mol), and E/Vm is the cohesive energy density (cal/cm3). where Δei is atomic and group contributions for the cohesive energy (E) and Δvi is atomic and group contributions for the molar volume (Vm). The solubility parameter of lignin and acetylated lignin can also be calculated based on the contribution of functional and atomic groups. Cohesive energy (E) and molar volume (Vm) are calculated by considering the contributions of atomic and functional groups for each phenylpropanoid unit. It is important to note that the Hildebrand solubility parameters are based on the non-polar interactions in the absence of hydrogen bonds. Therefore, in this study, hydrogen bonding interactions from the Hansen theory were also accounted for in lignin-solvent interactions. Hansen developed the solubility parameters in a theory based on three specific molecular interactions: dispersive interactions (δd), dipole-dipole interactions (δp), and hydrogen bonding interactions (δh) (Hansen 2000). Hydrogen bonding is a major molecular interaction, and although these bonds are considerably weaker than covalent bonds, they are much stronger than dipole-dipole interactions (Hansen 2000). The goal of this study was to understand the relationship between the chemical structure and the solubility of lignins (and acetylated lignins) from different sources in various organic solvents. Based on the Hildebrand theory, the maximum solubility should occur when the solubility parameter of the solvent is close to that of the lignin (or acetylated lignin). To apply these concepts, the solubility of lignin samples from different sources and acetylated lignin was determined in a series of organic solvents. The solubility parameters were then calculated based on their structural elements and functional groups. In addition, the molecular weight and hydroxyl content of soluble and insoluble parts of lignins in ethyl acetate were analyzed by using high performance size exclusion chromatography (HPSEC) and phosphorus nuclear magnetic resonance (31PNMR), and the effect of the molecular weight and hydroxyl content on the solubility of the lignin was investigated. Isolated lignin (L1 and L2) was obtained from the industrial residues from a bioethanol plant in the United States that uses hardwood and non-wood species and from a kraft pulp mill in Botucatu, Brazil, where the main species is eucalyptus. The method for isolation of L1 and L2 was reported in a previous paper (Sameni et al. 2016). Indulin AT (L3), a commercial softwood kraft lignin, was received from Westvaco Company, Richmond, VA, USA. Protobind (L4), a commercial non-wood soda lignin, was obtained from ALM, Chandigarh, India. Eleven organic solvents and water were used in this experiment. The solvents purchased were diethyl ether (Sigma, Oakville, Canada), chloroform (Sigma), acetone (BDH, Mississauga, Canada), ethyl acetate (Fisher, Ottawa, Canada), dichloromethane (DCM) (Caledon, Georgetown, Canada), dioxane (Caledon), dimethyl sulfoxide (DMSO) (Caledon), ethanol (Caledon), methanol (Caledon), pyridine (Caledon), and tetrahydrofuran (THF) (Caledon). Lignin samples were acetylated as previously described (Olarte 2011). Briefly, 1.0 g of oven-dried lignin was mixed with 40 mL of pyridine-acetic anhydride (1:1 v/v) solution and allowed to react for 24 h with mixing. The solids were re-precipitated with 150 mL of hydrochloric acid solution (pH 1.0) and collected by vacuum filtration. The solids were washed with HCl solution and deionized water. The collected solids were dried at 40 °C overnight (about 16 h) and stored in vials for further analysis. The solubility of lignin and acetylated lignin in organic solvents was determined as described by Cybulska et al. (2012) with minor modifications. A total of 10 mL of organic solvent was added to 100 mg oven-dried lignin (or acetylated lignin) at 23±0.5°C. Samples were sonicated for 10 min in a water bath sonicator. The insoluble fraction (if present) was filtered using a medium sized (10 to 15 µm pore size) filter crucible. Samples were dried at 50 °C for 4 h and then weighed. The soluble fraction of 100 mg lignin or acetylated lignin in 10 mL organic solvent was calculated by subtracting the insoluble fraction from the initial weight. Total aliphatic and phenolic hydroxyl of original lignins and the soluble part of lignins in ethyl acetate were determined by quantitative 31P NMR following published methods (Granata and Argyropoulos 1995; Cateto et al. 2008). The soluble lignin in ethyl acetate was collected after the filtration of the insoluble part. The solvent from the soluble portion was removed using a rotary evaporator. The collected sample was dried at 50 °C overnight (about 16 h) and sealed in a vial. A solvent solution of pyridine and CDCl3 (1.6:1 v/v) was prepared for dissolving the sample, internal standard (cholesterol, 85 mg/mL), and the relaxation reagent (chromium(III) acetylacetonate, 5.6 mg/mL). 2-chloro-4,4,5,5-tetramethyl-1,3,2-dioxaphospholane (TMDP) reagent was used for the phosphitylation of lignin samples. A 40.0 mg oven-dried lignin or soluble part of lignin in ethyl acetate, internal standard (100 µL), and relaxation solution (50 µL) were added to 50 µL of the solvent solution in a sealed vial. Then, 100 µL of the phosphitylation reagent was added, and the vial was shaken to ensure a homogeneous mixture. After derivatization, the resulting solution was transferred to a 3 mm tube for subsequent 31P-NMR acquisitions (256 scans with 8 s relaxation delay at 25 °C). The 31P-NMR spectrum was recorded by a 600 MHz DD2 spectrometer (Agilent Technologies, Santa Clara, USA). Molecular mass distributions of lignin as well as soluble and insoluble parts of four lignin samples in ethyl acetate were determined by the method described by Gonzalez et al. (2000). The soluble and insoluble parts of lignin in ethyl acetate were collected after the filtration of the insoluble part. The solvent from the soluble portion was removed using a rotary evaporator; both samples were dried at 50 °C overnight (about 16 h) and sealed in a vial. High performance size exclusion chromatography (HPSEC) was performed with a DIONEX DX600 chromatograph (Bannockburn, USA), a UV detector, and a PSS MCX column (1000 Å, 300 × 8 mm) to determine the molecular mass distribution of lignin samples in alkaline solution. The UV detector was adjusted to 280 nm due to the maximum UV absorption of the aromatic rings in the lignin molecular structure. Each lignin sample was prepared by dissolving 10 mg of the dry lignin sample in 100 mL of 0.1 M sodium hydroxide solution. The injection volume was 25 μL. The eluent was 0.1 M NaOH in Millipore water. Sodium poly(styrene sulfonates) standards (6520, 4230, 1830, and 1100 daltons) were purchased from Polymer Standard Services (Amherst, USA) for calibration of the column and for platting the calibration curve. Standard solutions were prepared by adding 10 mg of each polystyrene standard in 10 mL Millipore water. The number and weight average molecular weights were calculated based on the ASTM D5296-11 (2011) standard. The expanded C9 formula, number of double bonds equivalent (DBE), and the molar ratio of each phenylpropanoid type (syringyl, guaiacyl, and p- hydroxyphenyl) in four lignin samples were published in our previous work (Table 1) (Sameni et al. 2016). The solubility parameters of lignin and acetylated lignin were calculated based on the contribution of functional and atomic groups. Cohesive energy and molar volume were calculated by considering the contributions of atomic and functional groups for each lignin unit. Table 2 shows the atomic and functional group contributions to ei and vi in each lignin unit. Based on the number of double bonds and the number of atom groups in the expanded C9 formula and the ratio of G/S/H in each unit, the Δei and Δvi values for each lignin sample were calculated (Table 3). The solubility parameter of each lignin sample was calculated by the square root of the sum of Δei divided by the sum of Δvi in Eqs. 1 through 3. The solubility parameters for L1, L2, L3, and L4 were calculated as 12.87, 13.09, 13.42, and 12.92 (cal/cm3)1/2, respectively. These values were slightly lower than the value reported for other lignin types such as ALCELL lignin (13.7 (cal/cm3)1/2) (Ni and Hu 1995), hydrolyzed almond shell lignin (14.6 (cal/cm3)1/2) (Quesada-Medina et al. 2010), and bagasse lignin (14.0 (cal/cm3)1/2) (Wang et al. 2011). The reason for obtaining lower solubility parameters could be mostly due to using the number of aliphatic hydroxyl groups in expanded C9 formula. The solubility parameter of acetylated lignin was calculated in a similar way as for lignin by replacing acetate groups with total hydroxyl groups in each unit (Table 4). It was assumed that all hydroxyl groups were substituted with acetyl groups. Therefore, the number of acetyl groups for acetylated lignins was calculated by sum of aliphatic and phenolic groups in the expanded C9 formula. The solubility parameter for ACL1, ACL2, ACL3, and ACL4 was obtained as 10.97, 11.32, 11.03, and 11.04 (cal/cm3)1/2, respectively. The calculated solubility parameter of acetylated lignin was lower than its original lignin because the cohesive energy for the hydroxyl group was 26.7 (cal/cm3)1/2, while for the acetyl group was 10.5 (cal/cm3)1/2. Therefore, the difference between the solubility parameters of lignin and acetylated lignin depended on the number of hydroxyl groups in the lignin molecule. The solubility parameter (δ) from the Hildebrand theory and hydrogen bonding parameter (δh) from the Hansen theory of each solvent is listed in Table 5. The hydrogen bonding parameter in Hansen theory would be useful in some explanation. Due to the capability of hydrogen bonding, the hydrogen bonding parameter of organic solvents such as ethanol or methanol is much higher than other organic solvents. The hydrogen bonding parameter was used to evaluate the hydrogen bonding capacities of the organic solvents for the solubility of lignin because hydrogen bonding is a major molecular interaction between hydroxyl groups of lignins and the organic solvents with the ability to form hydrogen bonding (Pan and Sano 1999; Shukry et al. 2008). Based on the Hildebrand theory, lignin (or acetylated lignin) shows maximum solubility when the solubility parameter of the solvent is close to its own. Conversely, the solubility of the lignin (or acetylated lignin) in the solvent is lower when the difference between the two solubility parameters shows greater value. Therefore, based on the solubility parameters of organic solvents, the degree of lignin (or acetylated lignin) solubility as predicted by the solubility parameter theory should agree with the experimental results. 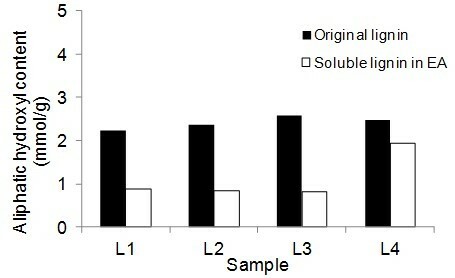 Figure 1 shows the solubilized fraction of 100 mg lignin in 10 mL of different organic solvents together with the Hildebrand solubility parameter (δ) of organic solvents. All lignin samples were almost completely soluble in DMSO and pyridine and partially soluble in the other nine organic solvents and water. The solubility parameters of DMSO and pyridine are 12.9 (cal/cm3)1/2 and 10.6 (cal/cm3)1/2, respectively. Based on the Hildebrand theory, it is expected that when the solubility parameters of lignin and the solvent are the same, the ability to dissolve the lignin will increase. Therefore, DMSO with a similar solubility parameter as lignin is expected to be one of the best solvents for lignin. Pyridine is also a good lignin solvent, having an even smaller solubility parameter than lignin. This behavior can be explained by an acid-base interaction between pyridine and the phenolic groups in lignin, which results in the high solubility of lignin in pyridine (Shukry et al. 2008). It is important to note that the chemical interactions such as the acid-base interaction are not considered in Hildebrand theory. Dioxane, DCM, and acetone have similar Hildebrand solubility parameters of about 10 (cal/cm3)1/2. However, the results showed that L3 was moderately soluble in dioxane and slightly soluble in DCM and acetone. The reason for the higher solubility of lignin in dioxane might be due to formation of hydrogen bonds between lignin and the solvent (hydrogen bonding parameter of dioxane is greater than acetone and DCM). In addition, L3 with a high number of aliphatic hydroxyl groups showed more solubility in dioxane than DCM and acetone. The solubility parameters of THF, chloroform, and EA are in the order of 9.5, 9.2, 9.1, respectively. THF should be a better solvent than chloroform and EA for lignin due to its closer solubility parameter to the solubility parameters of lignin. However, the results showed that the solubility of lignin in EA was higher than the predicted value based on the Hildebrand theory. EA is a weak hydrogen bond acceptor and a moderately polar solvent. It has the advantages of being volatile, relatively non-toxic, and non-hygroscopic. EA is commonly used as an industrial solvent for many applications such as paints, coating, adhesive, inks, plastics, fats, and drug intermediate. It also has the potential to be substituted with DCM in the fabrication of lignin microspheres (Sameni 2015). The solubility of lignin in diethyl ether was very low due to a significant difference between the solubility parameter of all lignin and the solvent, and also to a very low hydrogen bonding parameter of the solvent. The oxygen atom in the diethyl ether molecule makes it a hydrogen bond acceptor. However, its effect is very low in the increase of solubility of lignin. Horvath (2005) stated that the solubility of lignin is greater with hydroxylated solvents such as methanol and ethanol than that of nonpolar solvents. The solubility parameter of ethanol [δ = 12.9 (cal/cm3)1/2] is very similar to the solubility parameter of lignin samples, but the solubility of lignin in ethanol was lower than the predicted value. The low solubility of lignin in ethanol can be explained based on the Hansen theory, where the hydrogen bonding parameter (9.5 (cal/cm3)1/2) of ethanol is very high as compared with other organic solvents (Table 5). Shukry et al. (2008) reported that ethanol was not efficient for dissolving acetosolv lignins due to a high value of hydrogen bonding parameter. Although the solubility parameter of lignin is closer to the solubility parameter of ethanol than that of methanol, it seems methanol is a better solvent for lignin. This is due to the smaller molar volume of methanol than ethanol. The dissolution rates are strongly dependent on the molar volume of methanol and ethanol because the penetration rate increases with decreasing solvent size (Papanu et al. 1990). In addition, the solubility of L3 in methanol is much higher than in ethanol. The reason for this sizable difference may be explained by the hydrogen bonding parameter for methanol, which is greater than the hydrogen bonding parameter for ethanol and has a higher number of aliphatic hydroxyl groups in L3 as compared with other lignin samples (Table 1). As expected, the solubility of all lignin samples was very low in water due to large differences in the solubility parameters of lignin and water. In addition, a direct correlation was observed between the number of OH groups in C9 formula and the solubility of lignin in water. Increasing the number of OH groups in the C9-formula increased the solubility of lignin in water. Lignin solubility suggests that there is no specific agreement about the solubility of lignin in organic solvents. Rahman et al. (2013) reported that 10 mg L3 (commercial lignin) was completely soluble in 1 mL DMSO and was partially soluble in THF and chloroform. In this study, 100 mg L3 was almost soluble in 10 mL DMSO (96 mg/10 mL) but was slightly soluble in THF (8 mg/10 mL) and nearly not soluble at all in chloroform. Cybulska et al. (2012) reported the solubility of different types of organosolv lignin (i.e., prairie cordgrass, switchgrass, and corn stover lignins) in organic solvents. The highest solubility of lignins is in methanol and dioxane and non-significant solubility in ethyl acetate (Cybulska et al. 2012). Horvath (2005) stated that the ability of a solvent to dissolve a variety of isolated lignin was increased by increasing the hydrogen-bonding capacity of the solvent. There are several aspects in polymer dissolution, one of which is the polymer molecular weight. 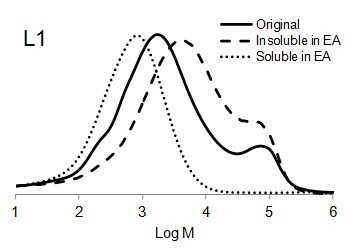 Figure 2 shows the relationship between the molecular weight and the solubility of four lignin samples in organic solvents. The molecular weight of four lignin samples was reported in a previous paper (Table 1) (Sameni et al. 2016). 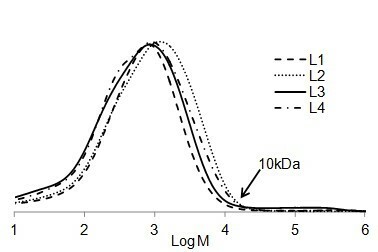 The solubility of L2, L3, and L4 (lignin with uniform molar mass distribution) was decreased with an increase in the molecular mass of the lignin. The solubility of L1 in organic solvents was higher than the expected values due to its bimodal molar mass distribution. L2, having the lowest molecular weight, was dissolved in organic solvents more than other lignin specimens. It has been reported that lignin with lower molecular weight is more soluble in most common organic solvents (Alriols et al. 2009; Horvath 2005). As expected, the solubility of L3 was lower than L2 and L4 due to its higher molecular weight. Manjkow et al. (1987) found that the dissolution of polymer depends on polymer molecular weight and polydispersity. The dissolution of polymer is controlled by chain disentanglement, which is a function of the molecular weight (Parsonage et al. 1987). Polymers with smaller molecular weights yield a higher degree of disentanglement. As a result, lower molecular weights of polymers have a higher degree of swelling when dissolution occurs. The solubility of acetylated lignin in organic solvents is demonstrated in Fig. 3. The acetylation of lignin is a technique that is used to increase the solubility of lignin in organic solvents such as THF and DMSO (Olarte 2011). In this study, 100 mg specimens for all four acetylated lignin were almost completely soluble in 10 mL of ethyl acetate, chloroform, THF, dichloromethane, acetone, and pyridine [solubility parameter from 9.1 (cal/cm3)1/2 to 10.6 (cal/cm3)1/2] due to the similar solubility parameters of acetylated lignin and solvents. However, even though the solubility parameter of DMSO was much greater than acetylated lignin, it is still a good solvent for all acetylated lignin. DMSO has a very high dipole moment, and it is a good solvent for large lipophilic compounds that have some type of dipole moment in the structure. DMSO with a large dielectric constant is energetically able to interact with large hydrophobic molecules that contain functional groups possessing a dipole moment (Borchardt et al. 2005). Therefore, the solubility of acetylated lignin in DMSO is high because the number of dipole carbonyl groups is significantly increased after acetylation. Dipole moment is the factor that was not considered in Hildebrand theory, but was explained by Hansen theory. However, in this paper we didn’t study the dipole parameter from Hanson theory. The solubility parameter of diethyl ether is much lower than acetylated lignin; therefore, diethyl ether is considered a poor solvent for acetylated lignin. 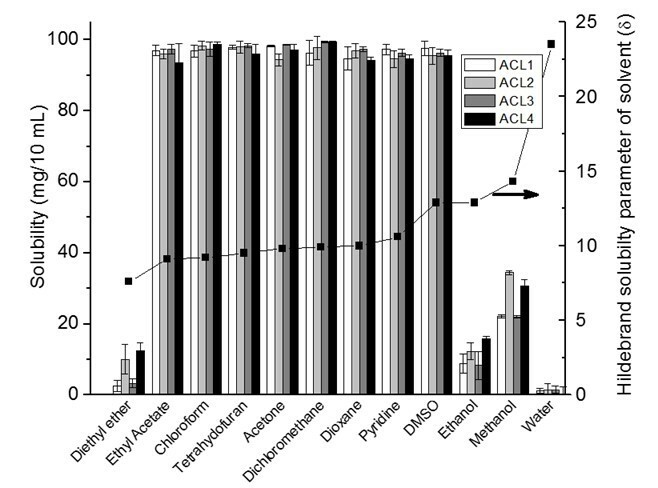 The significantly low solubility of acetylated lignin in methanol, ethanol, and water can be explained by the significant differences between the solubility parameter of the solvent and the acetylated lignin. Figure 4 shows the hydroxyl content of lignin samples as well as the aliphatic and phenolic hydroxyl content for the soluble part of lignin samples in EA by using 31PNMR (Sameni et al. 2016). The hydroxyl content in lignin samples was obtained by the integration of each spectral region. The signals in the range of 149.2 ppm to 146.0 ppm were associated with aliphatic hydroxyls groups. The phenolic hydroxyl region is in the range of 144.3 ppm to 137.2 ppm. Signals in the range of 143.1 to 142.4 ppm (144.3 to 140.5 ppm for softwood kraft lignin), 140.0 to 138.8 ppm, 138.2 to 137.2 ppm, and 135.6 to 133.7 ppm were attributed to syringyl, guaiacyl, p-hydroxyphenyl phenolic hydroxyls, and carboxylic acid units, respectively (Cateto et al. 2008; Zhang et al. 2013). 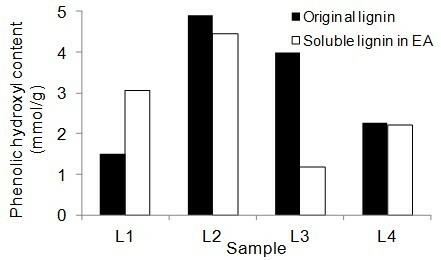 Figure 5 shows the number of aliphatic and phenolic hydroxyls of lignin samples and the soluble part of lignin samples in EA. The aliphatic hydroxyl content in the soluble part of lignin was lower than the original lignin. Therefore, it seemed that the part of lignin macromolecules with less hydroxyl groups was more soluble in EA. The phenolic hydroxyl content of the soluble part of lignin varied between the four lignin samples. However, it was not clear whether the phenolic hydroxyls contributed to the solubility of lignin. 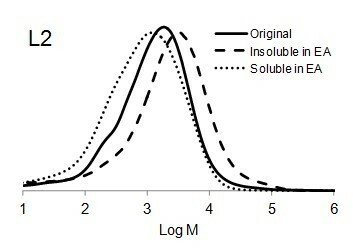 Figure 6 shows the molar mass distribution of each original lignin sample as well as the soluble and insoluble part of lignin samples in ethyl acetate. 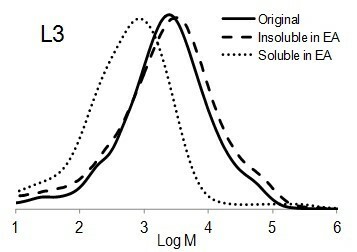 The molar mass distribution of the insoluble part of all lignin samples in EA showed higher molar masses than original lignin samples. 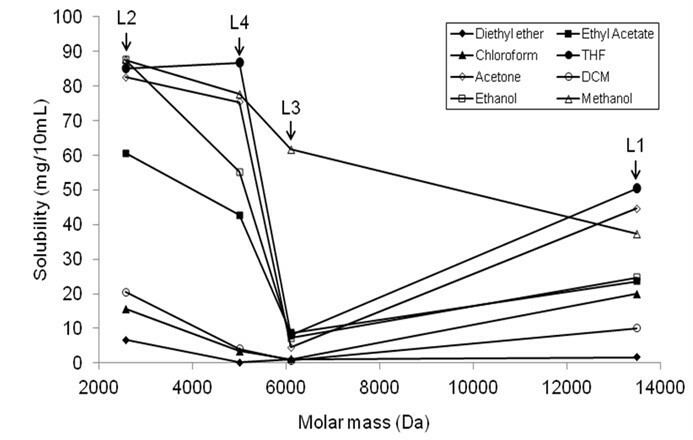 In contrast, the molar mass distribution of the soluble part of lignin in EA was shifted to lower molar mass values. Thus, the portion of lignin with lower molar mass was dissolved in ethyl acetate and the higher molar mass remained insoluble. 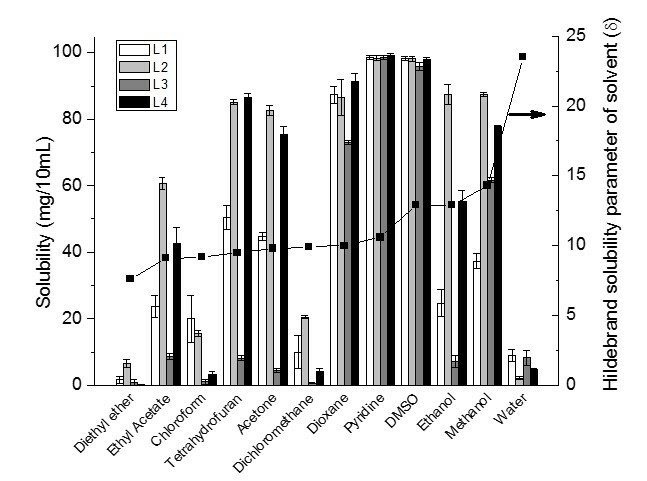 It is interesting to compare the molecular weight distribution of the soluble part of different lignin types in EA (Fig. 7). Although the solubility of each lignin was different in EA (Fig. 1), it seemed that the size distribution for all soluble parts of the lignin samples were the same. The highest molar mass of all soluble lignin samples in EA was approximately 10 kDa. In other words, EA was able to dissolve lignin macromolecules with the molecular weight of less than 10 kDa. The number-average (Mn), weight-average (Mw), peak (Mp) molecular weights, and polydispersity (PD) (Mw/Mn) of original lignins as well as the soluble and insoluble part of the lignin samples in EA are summarized in Table 6. PD is a measure for the heterogeneity of molecules sizes. The bimodal molecular weight distribution of L1 could have resulted due to repolymerization of lignin during steam explosion process. Li et al. (2007) stated that repolymerization and depolymerization (cleavage of β-O-4) of lignin may simultaneously occur during steam explosion process depends on the severity factor which produce more heterogeneous lignin structure (Li et al. 2007). It is very difficult to compare the molecular weight distribution of industrial lignins because the results differ depending on the method (Schorr et al. 2014). For instance, the Mw, Mn, and PD for Indulin AT (L3) were reported 6549, 656, and 9.9 (Hu et al. 2016), and 4549, 1248, and 3.6 (Schorr et al. 2014), respectively. In general, the molecular weight of lignin depends on the degree of fragmentation during the delignification process. In the kraft process, α-aryl and β-aryl linkages, while in the soda process α-aryl linkages are cleaved (Tejado et al. 2007). Therefore, L2 was expected to have a lower average molecular weight than L4. On the other hand, the molecular weight of L3 was found to be higher than L2 and L4 lignins. This result can be related to more condensed structure of softwood lignins (Schorr et al. 2014). The data showed that the Mw, Mn, Mp, and DP of the soluble part of all lignin samples in EA were lower than in the original lignin, while the insoluble lignin in EA showed greater values than the original lignin. About 75% of L1 was not soluble in EA, which could be due to high Mw (approximately 19 kDa) and bimodal molar mass distribution. 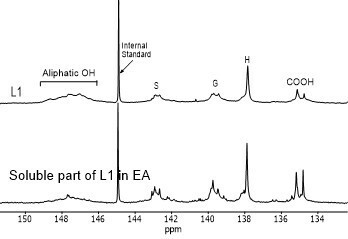 Notably, the soluble part of L1 in EA contained the lowest molecular weight among all four lignin samples. 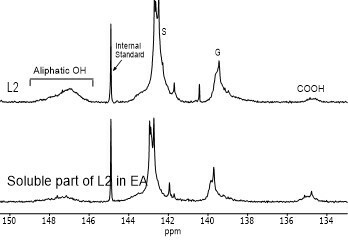 L2 with the lowest molecular weight was the most soluble lignin in EA. 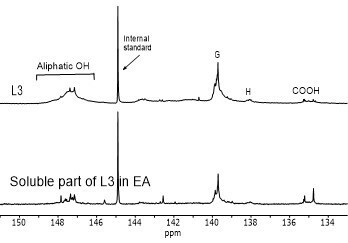 The molecular weight of the insoluble part of L3 was about 9.5 kDa, which could have been the reason for low solubility of L3 in EA. 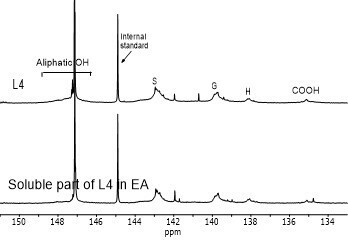 L4 exhibited about 60% of insolubility in EA with the molecular weight of 6.5 kDa. The solubility of lignin from different sources in organic solvents was not completely predictable by using Hildebrand solubility parameters. However, the solubility of acetylated lignin samples was predictable due to the absence of hydroxyl groups in the lignin macromolecule. Lignin exhibited maximum solubility only in pyridine and DMSO, while all acetylated lignin samples were completely soluble in ethyl acetate, chloroform, THF, acetone, DCM, dioxane, pyridine, and DMSO. Lignin with lower molecular weight was more soluble in organic solvents, but a lower aliphatic content increased the solubility of lignin in organic solvents. The solubility of lignin in organic solvents depended on the molecular weight and the number of hydroxyl groups in lignin units. Only the lignin fraction with a molecular weight less than 10 kDa was soluble in ethyl acetate. The number of hydroxyl groups in the soluble part of lignin in EA was lower than the original lignin. Therefore, the part of lignin with a lower number of hydroxyl groups was more soluble in ethyl acetate. The authors are grateful for the financial support from the Ontario Research Fund-Research Excellence (ORF-RE) program. ASTM D5296-11 (2011). “Standard test method for molecular weight averages and molecular weight distribution of polystyrene by high performance size-exclusion chromatography,” ASTM International, West Conshohocken, USA. Borchardt, R., Kerns, E., Lipinski, C., Thakker, D., and Wang, B. (2005). Pharmaceutical Profiling in Drug Discovery for Lead Selection, American Association of Pharmaceutical Scientists, Arlington, USA. Hansen, C. M. (2000). Hansen Solubility Parameters: A User’s Handbook, CRC Press Boca Raton, FL, USA. Hildebrand, J., and Scott, R. (1950). The Solubility of Nonelectrolytes, Reinhold, New York. Horvath, A. L. (2005). “Solubility of structurally complicated materials: I. Wood,” Journal of Physical and Chemical Reference Data 35(1), 77-92. Jeong, H., Park, J., Kim, S., Lee, J., and Cho, J. W. (2012). “Use of acetylated softwood kraft lignin as filler in synthetic polymers,” Fibers and Polymers 13(10), 1310-1318. Manjkow, J., Papanu, J., Hess, D., Soane, D., and Bell, A. (1987). “Influence of processing and molecular parameters on the dissolution rate of poly‐(methyl methacrylate) thin films,” Journal of The Electrochemical Society 134(8), 2003-2007. Olarte, M. V. (2011). Base-catalyzed Depolymerization of Lignin and Hydrodeoxygenation of Lignin Model Compounds for Alternative Fuel Production, Ph.D. Dissertation, Georgia Institute of Technology, Atlanta, USA. Papanu, J., Hess, D., and Bell, A. (1990). “Swelling of poly (methyl methacrylate) thin films in low molecular weight alcohols,” Journal of Applied Polymer Science 39(4), 803-823. DOI: 10.1002/app.1990.070390404. Sameni, J. K. (2015). Physico-Chemical Characterization of Lignin Isolated from Industrial Sources for Advanced Applications, Ph.D. Dissertation, University of Toronto, Canada. Article submitted: October 24, 2016; Peer review completed: December 12, 2016; Revised version received and accepted: January 1, 2017; Published: January 13, 2017.